← HAPPY VETERANS DAY!!! TO ALL THAT SERVED AND THE ONES STILL SERVING …I LOVE YOU!!! In a stunning reversal, the Los Angeles Lakers hired Mike D’Antoni late Sunday night, spurning Phil Jackson, whose contract demands were apparently too steep. 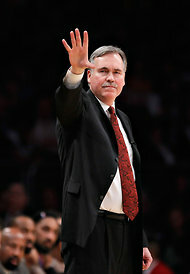 Mike D’Antoni was named head coach of the Los Angeles Lakers on Sunday. D’Antoni will sign a four-year deal worth $12 million, according to reports. His debut on the Lakers bench could be delayed a few weeks while he recovers from knee-replacement surgery. D’Antoni is a natural fit for the Lakers, on many levels. He had his greatest success in Phoenix with point guard Steve Nash, who is now playing for the Lakers. He is close to Kobe Bryant, the franchise star. And he runs an up-tempo offense that conjures memories of the 1980s Showtime Lakers. For all of the success the Lakers had running Jackson’s triangle offense for most of the last 12 years, the team owner Jerry Buss has always longed for a return to Showtime. That tension contributed to the divorce between Jackson and the Lakers in 2004 and lingered throughout his second stint with the team, from 2005-11. Jim Buss, the owner’s son, who oversees basketball operations, was never a fan of the triangle, or Jackson. The decision to hire D’Antoni was made by the owners and General Manager Mitch Kupchak, a Lakers spokesman said. “Dr. Buss, Jim Buss and Mitch Kupchak were unanimous that Mike D’Antoni was the best coach for the team at this time,” the spokesman John Black told the Los Angeles Times. Over the weekend, all signs pointed to a Lakers-Jackson reunion. The parties met at length Saturday morning, and everyone left with a basic understanding: the franchise wanted Jackson to return, and Jackson wanted the job. He even began lining up his staff. A deal was said to be imminent, provided no one had second thoughts and contract terms could be agreed upon. In the meantime, the Lakers interviewed D’Antoni as a contingency. Talks with Jackson broke down Sunday, with the Buss family refusing Jackson’s request for a stake in team ownership, according to the Los Angeles Times, which cited an anonymous source. The Lakers fired Mike Brown as their coach last Friday, after stumbling to a 1-4 record. For the next two home games, their arena was filled with chants of “We want Phil!” Bryant, who won five titles under Jackson, enthusiastically endorsed his return. Bryant has known D’Antoni since childhood. D’Antoni was a star in the Italian league when Bryant’s father played there. The two have become close during their time with the United States national team. D’Antoni resigned as the Knicks’ coach in March after losing a battle of wills with Carmelo Anthony. His best years came in Phoenix, where he guided the Suns to two Western Conference finals, in 2005 and 2006. The Suns averaged 58 wins in his four full seasons, and D’Antoni was named the N.B.A. Coach of the Year in 2004-5. D’Antoni’s staff is likely to include his brother Dan D’Antoni and Phil Weber, who coached with him in Phoenix and New York. D’Antoni will not have to wait long to face his former team. The Lakers visit Madison Square Garden on Dec. 13. The Knicks will play at Los Angeles on Dec. 25.